It isn’t an easy question to answer. There are lots of factors to consider when we analyze what works well on NPR One. But a good place to start is by looking at the stories people share or mark as “interesting.” Those are the stories listeners are most excited about. It is the number of “interesting” interactions plus the number of shares, divided by the number of listens a story got. It basically tells us how engaging a story is. I recently wanted to find out if the stories people engaged most with followed any patterns we could learn from. My hope was to discover more ways to create stories people really connect with on NPR One and beyond. 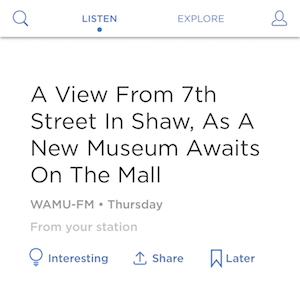 For three months, I went through NPR One data and looked at all the local segmented content (aka features and interviews shorter than 12 minutes) that had over 300 listens. What emerged looked familiar. In my NPR One analysis, the low-performing stories were very different. They called to mind another story classification created by Jay Kernis, a former NPR VP of Programming. The stories that didn’t a lot of engagement in my NPR One analysis were the typical news stories Kernis describes as Tier 2 stories. These are reports on meetings, political and judicial pronouncements and news conferences. In general, the Tier 2 stories at the bottom of the rankings were ones where there wasn’t much news. The stories that did well in this analysis were more likely to be what Kernis describes in Tier 4 — those stories about things that make a lasting difference in a community, as well as overlooked trends and events. While “9 types” and “Tier 4” were the top-performing stories, they aren’t the only ones you should cover. Engagement is just one view into the types of stories people value. Stories that get high “high positives” can be different from stories that have a low skip rate. For instance, people sometimes listen without skipping to pieces about controversial politicians, but they don’t share those stories or mark them as “interesting.” There may also be differences in the types of stories people want in newscasts versus longer form features. You need to ask why someone would connect with your story. It should provide context, meaning and relevance to the people in your unique community. Your newsroom doesn’t need to chase different types of stories for web and audio platforms like NPR One. The audiences in both places value the same types of local stories. When you have a local story that answers an interesting local question, taps a sense of local pride or is one of the other “9 types,” share it far and wide. You’ve done the reporting work, now you need to help the story find its audience. NPR One can’t provide all the answers about what you should cover in your community. But NPR One data can provide a glimpse into how your listeners behave when they hear certain types of stories. Once you know what are they responding to, you can craft your stories to have the most impact possible.